The San Francisco Museum of Modern Art is the city’s premier high culture museum with some 50,000 square feet of gallery space filled with modern and contemporary art. Its collection has surpassed 26,000 works and includes such blue chip names as Warhol, Pollock, Matisse, Rauschenberg, Rivera, Klee, Weston and on and on. 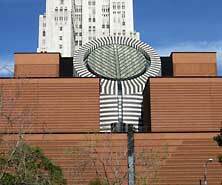 In ranking modern art museums in the US, most reviewers list San Francisco's MOMA as second to only the MOMA in New York. It is housed in a signature building by Swiss architect Mario Botta, who was not satisfied to build just another “art filled box” such as is the case with the new de Young Museum. 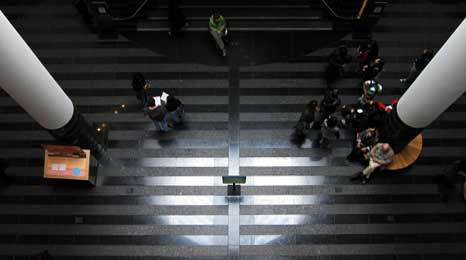 Instead he gave San Franciscans an art filled brick box with a giant Cyclops of a skylight. Not only does this skylight distinguishes it from the outside, but provides a spectacular open space inside. The building’s overall effect is just as cutting edge as much of its contents. When one has reached the museum saturation point, there are two in-house avenues of relief. One is Caffè Museo with its espresso bar on the ground floor. The other is the Rooftop Coffee Bar operated by the Blue Bottle Coffee Company. The more artsy types among the Blue Bottle staff have created cakes and cookies inspired by the works in the museum’s collection for those who truly want to be nourished by art. These can be enjoyed at the rooftop sculpture garden, which sadly is walled, prison yard style, depriving one of a city view. The museum is quite popular, especially on weekends. A tip to keep in mind is that tickets can be bought online avoiding long lines.